No matter what you call it swiss roll, jelly roll or roulade, this cake is just a sponge cake that is rolled with jam or cream filling. I don’t like matcha (green tea) if it’s served as a drink, unless adding some sweeteners and whipped cream with shaved ice to it. Nonetheless, matcha is a perfect element for enhancing flavor for cake. The popular mistake for most of the cake makers that use matcha is the very small amount of it added to the cream or the sponge cake. Don’t ever worry about the bitterness of matcha. I really intimidate the bitterness when making this cake: bitterness from green tea, and bitterness from dark chocolate. 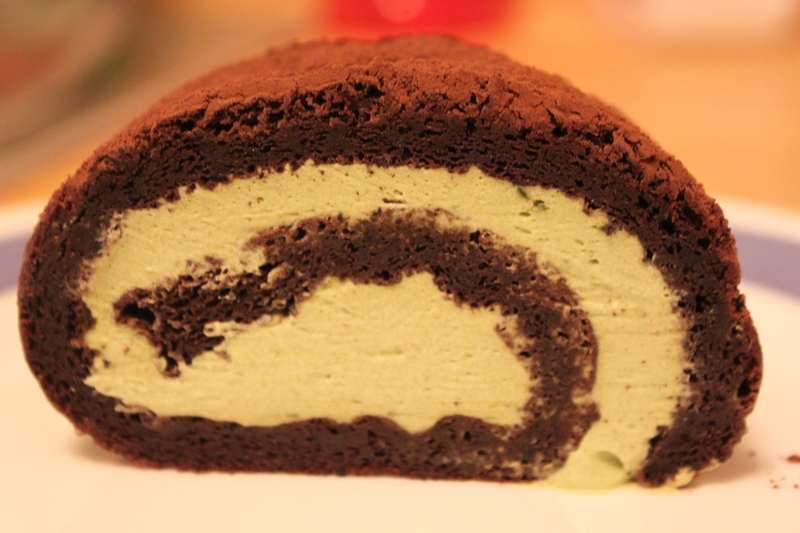 Voila, this roulade ( I used to like to call rolled cake as roulade, but left the swiss roll as the title’s name of this post because a lot of people like that name) really worths my try. It’s not bitter at all, I promise you! – Leave 1 tbsp cocoa powder (don’t pack it) in a bowl and set it aside. – Add 1/3 beaten egg whites to lighten the egg yolk mixture using a rubber spatula. – Fold the egg yolk mixture back into the beaten egg white and gently fold until well blended. – Bake in a jelly roll pan at 350 F for 10 minutes. – Sift 1 tbsp cocoa powder onto the hot surface of the cake. Gently invert the cake onto a towel and roll the cake. – Unroll the cake and spread the cream filling. – Gently roll the cake and cover with the plastic film. Refrigerate the swiss roll for at least 3 hours to firm the roll. – Sift 1 tbsp cocoa powder onto the swiss roll. – Slice the swiss roll for 1 inch (2.54 cm) thick and serve. This entry was posted in cake, dessert and tagged chocolate, green tea, japanese swiss roll, swiss roll. Bookmark the permalink. No matter what you like my writing or my recipe, I really love your comment. Hey, I’ve chosen your blog amongst 11 others to award the Liebster Award! Check the post out, have fun choosing your other blogs, and do follow my blog! thanks for chosing my blog as the nominee for that award. Tell me your result then.